Ever feel like you don't have what it takes? Like you can't be as good as those around you? Well, after waiting decades for his time to lead, Joshua had some big shoes to fill. He may have felt slightly intimidated by the task at hand. Joshua's predecessor, Moses, had a near spotless resume: he led the Jews out of Egypt, parted the Red Sea-he even conversed directly with God. Not exactly an easy act to follow. Yet Joshua's fearless confidence in God proved to be more than enough. God used Joshua in miraculous ways. All his life, the people of Israel followed and trusted Joshua's lead. What was his secret? 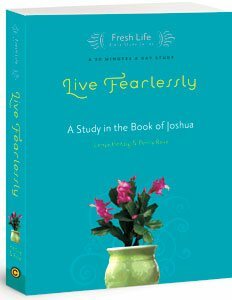 How did Joshua live so fearlessly? What can his story teach us today? The Fresh Life series was created by women, for women, who crave a profound experience of God's Word without an overwhelming time commitment. In just twenty minutes a day, you will come to a deeper understanding of the truths of the Bible. With a group or by yourself, use this easy-to-use study to develop a fearless, Joshua-like confidence in God so you can accomplish everything He asks you to do.